What can you do with old toilet paper tubes? 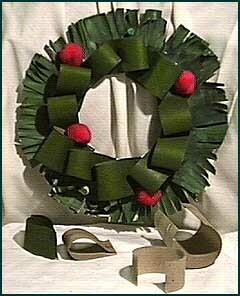 Make a cool Christmas Wreath! Almost all the materials in this projects are recycled things - except for the pom poms, which we had to buy at a craft store. Cut a strip up the middle of the cardboard tube, lengthwise. Then cut 1" strips crosswise. Paint the front and back of the strips green. When the paint is dry, staple the ends of the strips together to make the loops. Cut a 6" ring with a 3" diameter opening from the cardboard box. Cut small pieces of newspaper, about 2" x 1 1/2". Staple them to the outside edges of the ring. Paint both sides of the ring and newspaper green. When the paint is dry, "fringe" the newspaper, cutting from the outside edge to the inside. If you want, you can curl the edges by wrapping them around a pencil and holding for a minute. Glue the loops to the inside of the ring, like in the picture. You can make a bow for your wreath out of a brown paper bag or newspaper. First, cut a strip of paper about 6" long and 2" wide. Paint both sides red. Staple the ends together to make a big loop. Then press the ends together with the other side of the loop to make an "8". Staple once in the middle. Cut another small strip of the bag or newspaper about 2" long and 1" wide. Paint it green or white. Wrap it around the middle of your bow and glue the ends at the back. Then glue it onto your wreath.